We know from receiving calls from many people that several historic places have been affected by the catastrophic flooding in southern Alberta. Historically, communities in Alberta were often built close to rivers – sources of water to accommodate trade and travel. Needless to say, these low-lying areas where our communities grew up in the late 19th and early 20th centuries are also floodplains. We know that there are a total of 75 Provincial and Municipal Historic Resources within the evacuated areas of the City of Calgary alone. 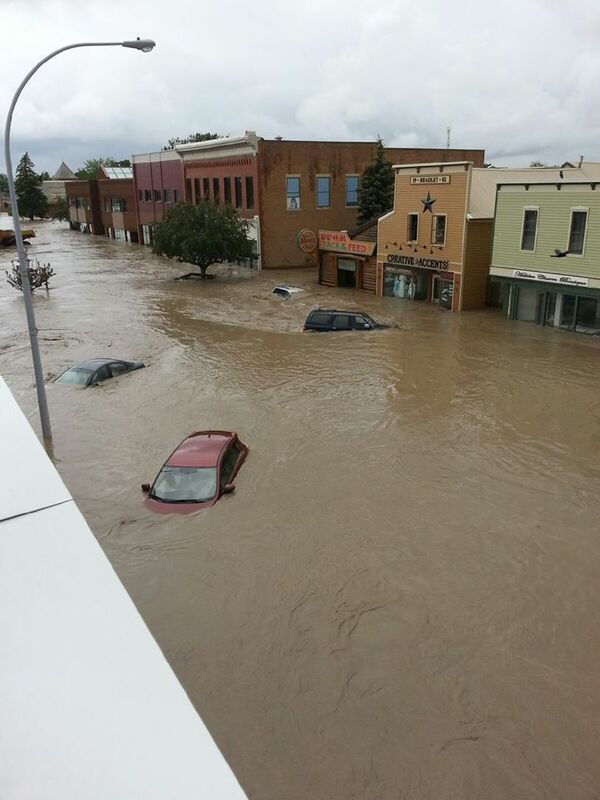 The Town of High River is one of the communities that has been devastated, and is still in a state of emergency evacuation. Over the past year, the Municipal Heritage Partnership Program has been working together with the Town on the second phase of an Inventory Project to evaluate the community’s significant historic places. It will remain to be seen how many of these places will survive the floods, and the extent of the damage. Other communities are in similar situations. At this point, still early on the recovery efforts, there are still more questions than answers. Some owners of designated historic places that have been flooded are wondering what they should do. Once the emergency needs for safety and the basics of life are provide for – what are the first steps in safeguarding and stewarding these historic places? The Historic Resources Management Branch has staff that are available to talk with owners of historic places, and to provide technical advice and support. We know that a major clean-up and conservation effort is now only beginning. We encourage owners of designated Provincial Historic Resources and Municipal Historic Resources to contact the Heritage Conservation Adviser for their region. Let us know how you are doing, and the current state of your historic property. We can help you to prioritize steps and make plans to help conserve your historic place for the future. Calgary Region: Eileen Fletcher, her office number is (403) 297-4074 and her cell number is (403) 618-4180. Southern Region: Fraser Shaw, his office number is (403) 297-4088 and his cell number is (403) 921-8139. Municipal and community officials can contact Matthew Francis, Manager of Municipal Heritage Services at (780) 438-8502. Their office numbers are toll-free by first dialing 310-0000. Above all, we hope everyone stays safe as we work together to create a future for Alberta’s historic places. 2013 Forum Registration Now Open! 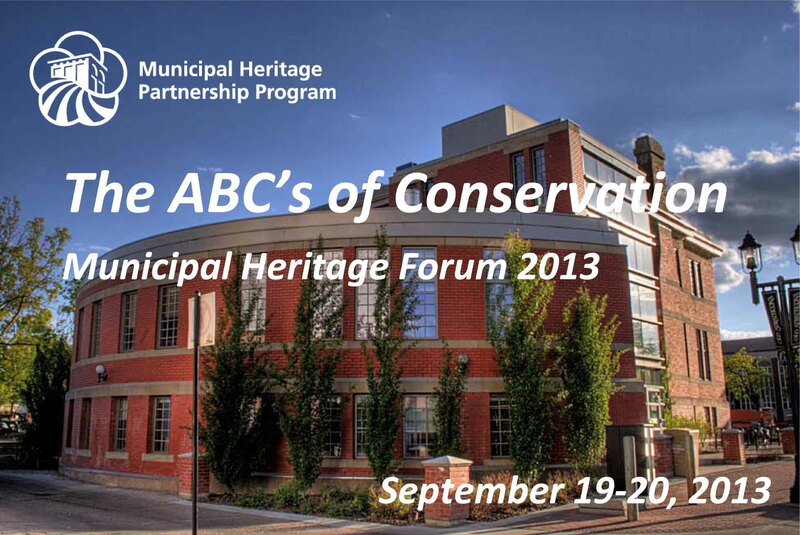 Registration is now open for the 2013 Municipal Heritage Forum: The ABC’s of Conservation. This year will feature not only informative and inspiring keynote presentations from Bernard Flaman and Todd Babiak, but also hands-on demonstrations of conservation practices. RETROactive will keep you informed about Forum workshops, schedule, and details. Space is limited, so please register online today. All Aboard for an Alberta Architecture Adventure! From May 29 through June 1 delegates from across the country (and a few from the United States and Europe) were treated to presentations, discussions and tours addressing a variety of aspects of Canadian architectural history. The conference kick-off was hosted at Edmonton’s city hall, and featured a talk and tour by the building’s architect, Gene Dub. Not surprisingly, he had many interesting anecdotes and insights to relate—including the memorable connection between the building and the Edmonton Sun newspaper’s 3rd page Sunshine Girls! Three full days of events followed. There were 10 session featuring over 40 speakers. To fit them all in, there were always two sessions on the go. How to choose? Would you rather learn about how cities are transformed by renewal, or what trends are influencing how architecture is taught in Canada? Are you more interested in the future of historic churches, or the place of Arthur Erickson in Canada’s architectural history? Those interested in a lively Pecha Kucha format discussion of the role of government programs in the conservation and commemoration of the built environment had to forego a panel discussion entitled “Architecture and the Canadian Fabric.” For students and professionals in the architectural history field, these are difficult decisions! 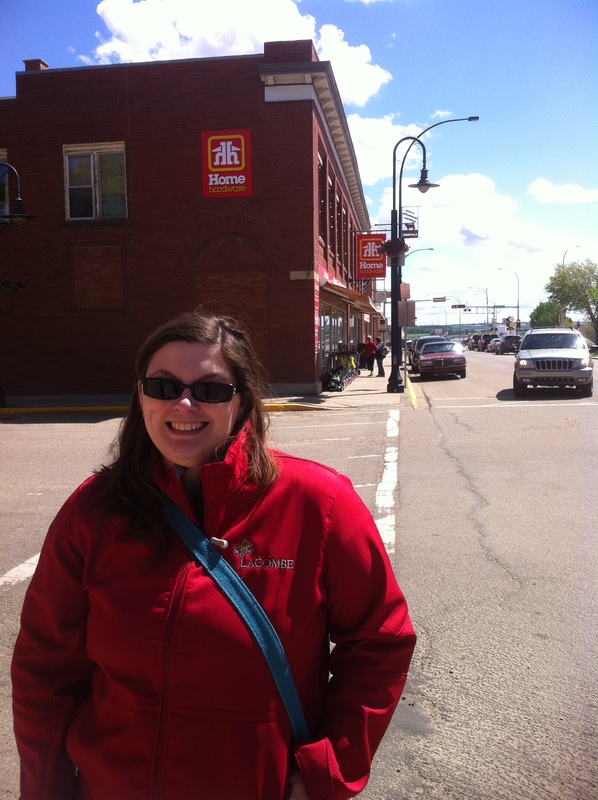 Jennifer Kirchner, Planner with the City of Lacombe, showed us around main street. Of course, delegates also found time to socialize, make connections and catch up on all the latest work being done in the field. No conference is complete without receptions and a night on the town! 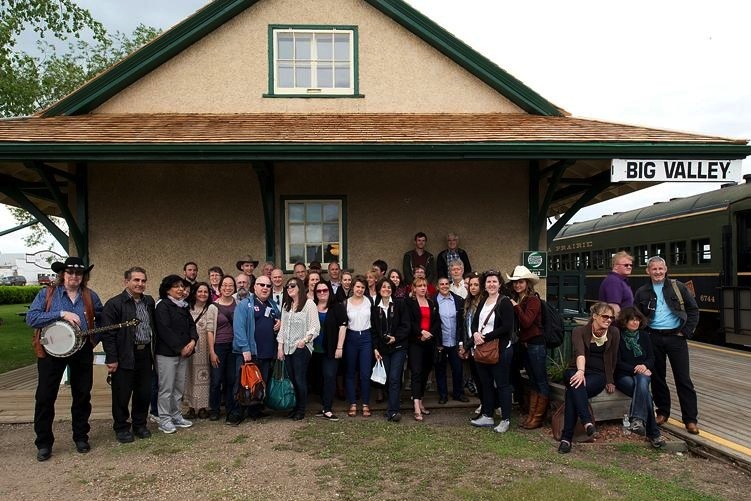 The grand finale of the conference was an all-day bus tour of historic buildings and communities in central Alberta. The day was bright and sunny as the bus set off from Edmonton. First stop was the 1907 Wetaskiwin Court House, which was converted to serve as the city hall in 2006. Next on the route was Lacombe, where Roland Michener House and the Flat Iron Building are just two of the Provincial Historic Resources the delegates visited in the city’s historic main street area. 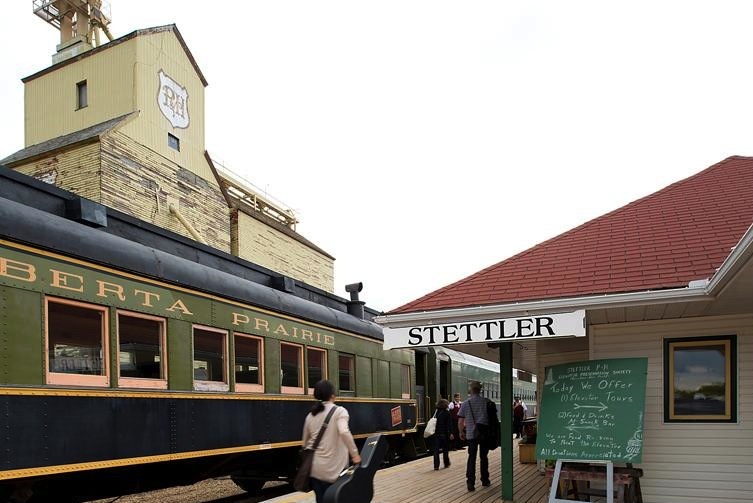 After an excellent lunch, the group continued on to Stettler and boarded the Alberta Prairie Railway Excursion’s train for Big Valley. The Canadian National Railways Steam Locomotive 6060—also a Provincial Historic Resource—was in the shop, but the historic train cars were a great way to set the scene. Stepping off the train at the 1912 Canadian Northern Railway Station in Big Valley was like stepping back in time. This impression was reinforced by the Alberta Wheat Pool Grain Elevator which, though it was built in 1960, is of a type that changed little since the early 1900s. On the hill overlooking the town is the well-known “Blue Church”, St. Edmund’s Anglican. 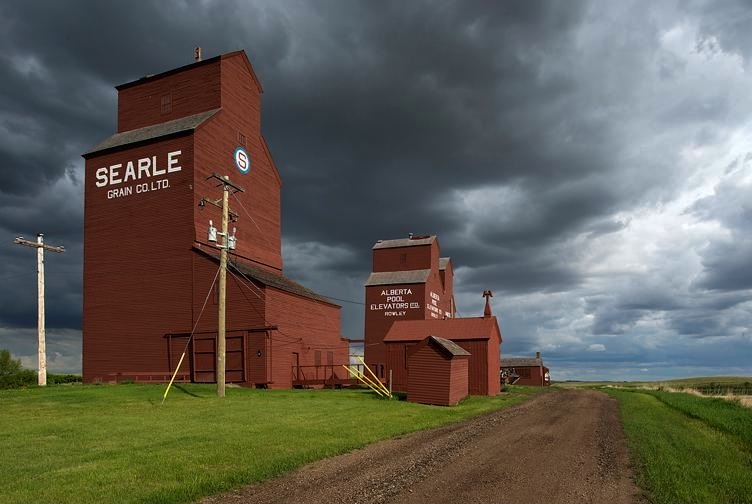 The final stop on the tour was Rowley, where the spectacular Rowley Grain Elevator Row symbolizes Alberta’s agricultural heritage. After a barbeque, a wander around town, and musical entertainment by Robin Woywitka and the Super 92, it was back on the bus and heading for home. The on-board movie was “Bye Bye Blues.” Watch it if you get a chance—it was filmed on location in Rowley! By the time the bus dropped us off in Edmonton, it was after midnight. Some went directly to their Whyte Avenue hotel, but on Whyte the night was just getting started, so doubtless others continued their Alberta adventures into the wee small hours! delegates pose in front of the Big Valley station. I recently had the good fortune of attending a course at the National Center for Preservation Technology and Training in Natchitoches, Louisiana on paint analysis for historic buildings. The Town of Natchitoches is in northern Louisiana and is situated around historic cotton plantations. The movie “Steel Magnolias” was filmed in Natchitoches during the late 1980’s. 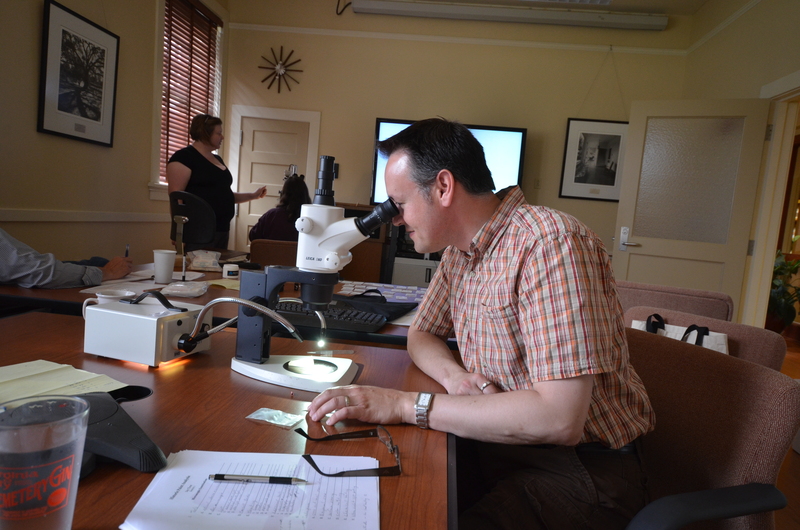 The course, Paint Analysis for Historic Buildings, was taught by David Arbogast. Mr. Arbogast is a renowned architectural conservator and paint specialist from Davenport, Iowa. During three intensive days we learned a great deal about the history of applied finishes (paints, stains, and clear coatings), architectural paint chemistry, the proper technique to restore deteriorated window mechanisms, how to collect field samples and analyze them in a laboratory and how to write up the findings. During the second day, we collected 43 paint samples from the nearby Old Courthouse Museum. Most of our samples were smaller than the diameter of a pencil—more than enough for laboratory analysis. Using an optical stereo microscope, we examined each one. From these tiny specimens we were able to determine the number of layers of coatings applied to a particular area, and the colour of each layer. Observing the microscopic lines of atmospheric deposits (mostly soot and dirt) we established how frequently the building was painted. We documented each colour identified according to the Munsell System of Colour, a standardised colour palette book that does not change with time and fashion. It was amazing to see that such tiny samples could offer so much information about how a building evolved over its life. It was a very intensive three days, but what I learned will be invaluable to my work as an architectural conservator or to anyone interested in knowing the evolution of coatings and colours used on their historic building. Help us put on a great forum! The 7th annual municipal heritage forum is coming up fast. We strive to present relevant and useful information for the municipalities we work with. Here in Old St. Stephen’s College, Matthew and I are busy planning two intensive, information-filled days. 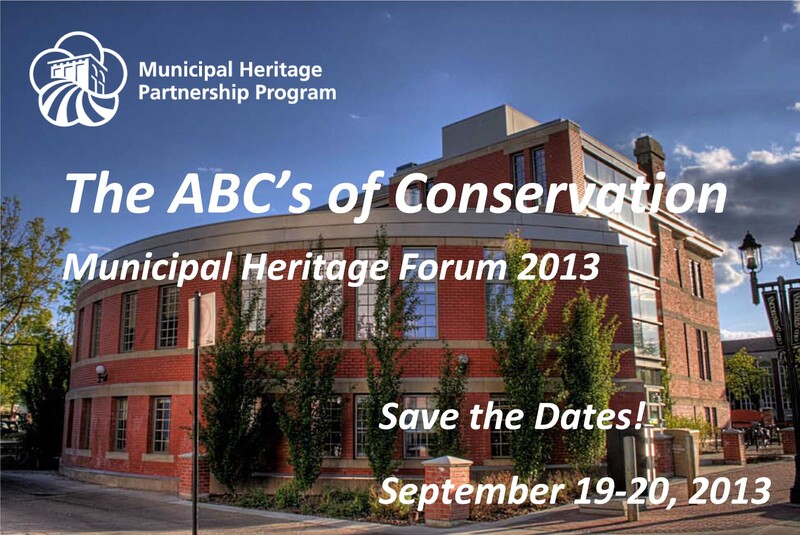 The forum is the Municipal Heritage Partnership Program’s signature event. 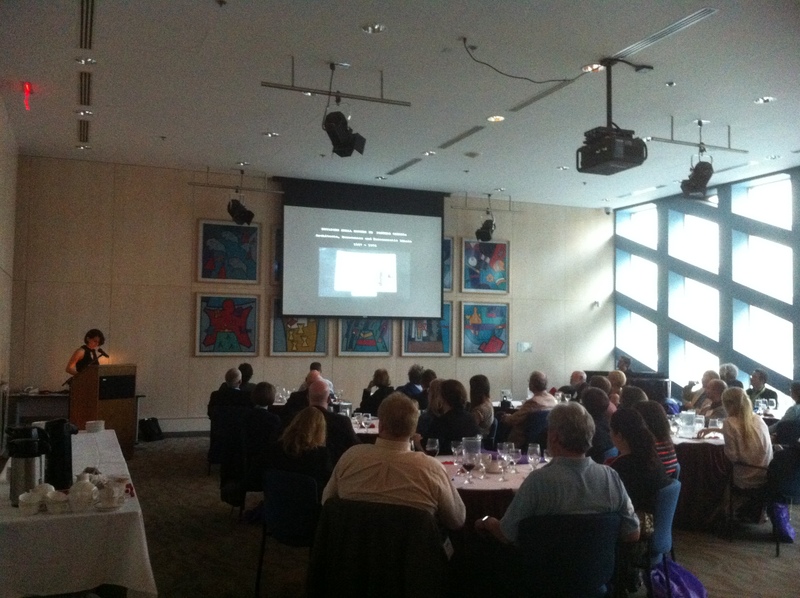 Many past participants have used what they’ve learned to improve their own municipal heritage conservation programs. We hope to build on that success. We were wondering if you could help us? We’d like to hear a little about what you hope to learn at this year’s forum. Please take a few minutes to participate in our online survey. The information you provide will help us organise the best forum yet. Queen Elizabeth II in coronation robes. © Cecil Beaton, 1953. 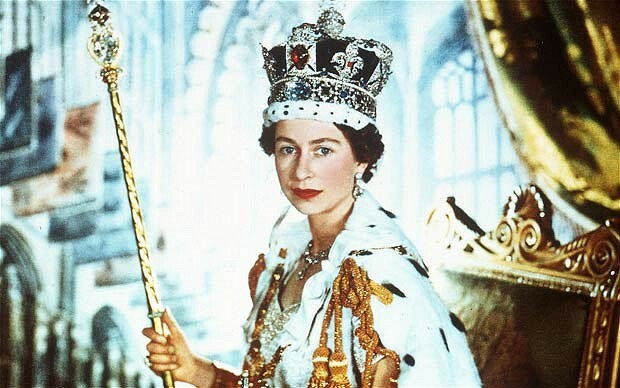 Last Sunday (June 2nd) was the 60th anniversary of Queen Elizabeth II’s coronation. She had been Queen for over a year at the time. (She ascended to the throne upon the death of King George VI, her father, in February 1952.) The timing allowed for a period of mourning for the late King and to organise the pomp and ceremony of a coronation. Canada marked the occasion by naming a large mountain range in Jasper National Park for our new Queen. Many places names in Canada have been inspired by members of the Royal family. To learn more about this you could revisit our post on the Royal Jubilee, Queen Elizabeth II and Place Names.